the perfect ingredient: coconut oil. In most of my stove top cooking (and baking sometimes, too) I now default to coconut oil. This is a recent switch in the last 2 years or so, but I really love the added boost of flavor and the amazing benefits that coconut oil has to offer. It’s also my go-to ingredient in many of my skin care routines and home-made products. Coconut oil is actually almost 92% saturated fat. Because of the fat content, it turns to a solid at room temperature. Let’s talk a little about the manufacturing of coconut oil. It’s a fairly lengthy process, but to summarize for you, coconuts are collected and broken open. The flesh inside is then allowed to dry. After the flesh has dried, it is heated at low temperatures to evaporate any additional moisture. This leaves the manufacturer with oil residue. Now, to expedite the process, many manufacturers use additional chemicals and additives to expedite drying and heating to extract the oils. If you purchase organic coconut oil, no chemicals were used during the process AND the coconut was also grown in an organic manner. I’m not one of those people that believes organic everything is a must, but I do try to go organic when I can or when chemical absorption would be very high, like in a case like this. Remember that we vote with our purchases. Purchase wisely! Why you Should Choose Virgin. I know, who knew this could be so complicated. Just like olive oil, coconut oil has different grades of oil. Virgin coconut oil is oil that is made from fresh coconut while refined coconut oil is made from the dried meat of the coconut. The refined coconut oil is typically what you see in stores. In this process, the oil needs to be refined, deodorized, and filtered through bleached clays to remove impurities. I try to stay away from the refined stuff, although it typically has a less ‘coconut-y’ smell if you’re not really into that. If you see extra virgin coconut oil, note that there really isn’t a process that makes the virgin coconut oil any more virgin, so this is just marketing at its finest. Okay, This Sounds Great. What Do I really Do with it? I’ll be posting a delicious cauliflower recipe that uses coconut oil tomorrow – make sure to check back! 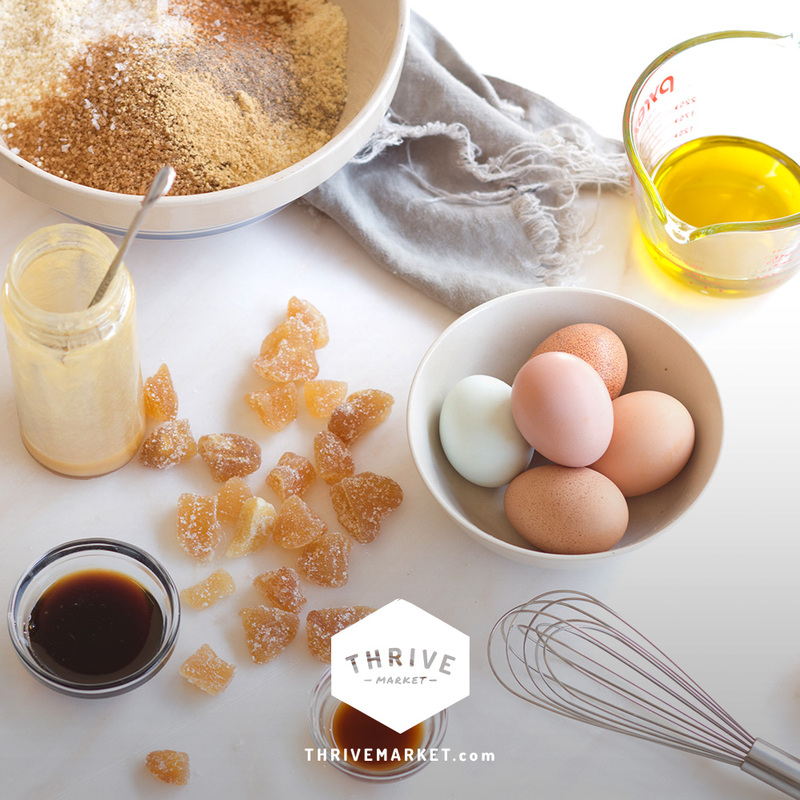 You may have noticed from the photos boldly declaring ‘THRIVE,’ but I’m also very excited to announce that we have partnered with Thrive Market (mentioned here in our Cacao Banana Shake recipe), as they are truly a company that has values that match ours. 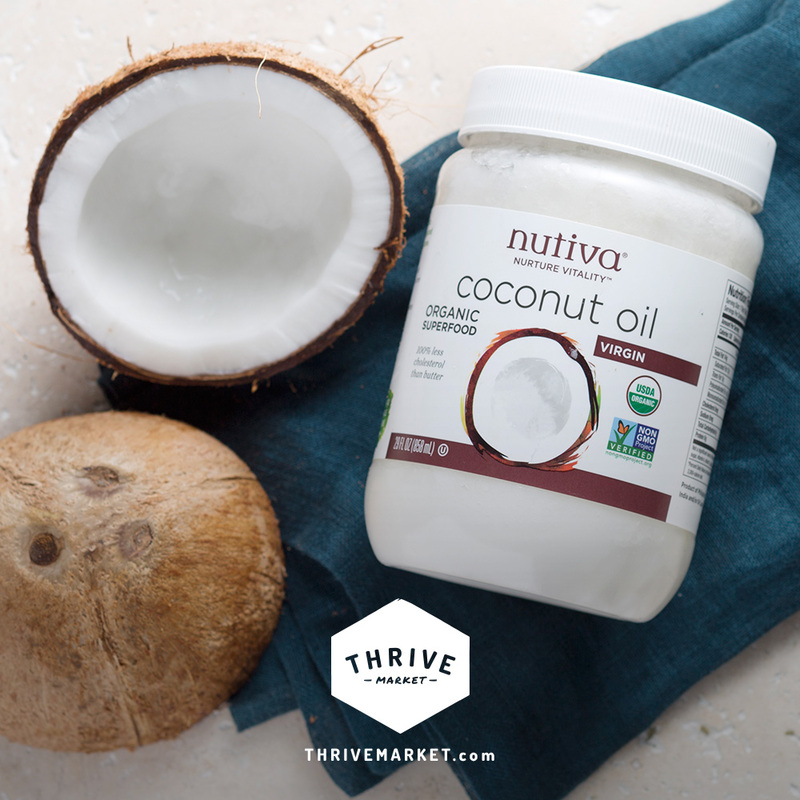 Even better, Thrive is now offering our followers and readers a free 30 day trial membership + a free 15-oz jar of Nutiva Coconut Oil + 15% off your next purchase! Just click here to see more details! Yes, that’s what I said! Just click here to sign up. For new Thrive members, you will receive the free coconut oil to try out and see if you like it. If you’re an existing member, you will still receive 10% off your order! What do you use coconut oil for? I’d love to hear more below!